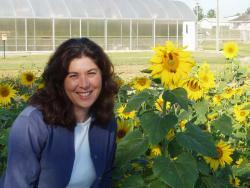 Danielle Treadwell is an Associate Professor and State Extension Specialist of organic and sustainable vegetable production in the Horticultural Sciences Department at the University of Florida in Gainesville. She also helps to lead the eOrganic Community of Practice in eXtension. Danielle received her M.S. and Ph.D. at the North Carolina State University. Her research program at the University of Florida is focused on scale neutral soil and cover crop management strategies that improve soil health, nutrient cycling and weed suppression. She also provides leadership for two statewide programs: the UF/IFAS Small Farms and Alternative Enterprises Extension team and the UF/IFAS Family Nutrition Program’s Farm to School, Farm to Community Extension team. Both programs emphasize food safety, new market opportunities, and nutrition, and strive to improve the economic, environmental, and social sustainability of local food systems in Florida.